The Duff Guide to Ska: Duff Guide to Ska Fast Takes: Desorden Publico "Bailando Sobre Las Ruinas"
Duff Guide to Ska Fast Takes: Desorden Publico "Bailando Sobre Las Ruinas"
Desorden Publico Bailando Sobre Las Ruinas (pink, red, yellow, olive green, sea green vinyl LP with artwork by CHema Skandal, Jump Up Records, 2017): This limited-edition record (200 copies) was released in the USA to coincide with Desorden Publico's tour of the States last fall, though the album actually came out in Venezuela during the summer of 2016. While my high school Spanish is crude at best, the title of the album translates into English as Dancing on the Ruins--and many of the absolutely amazing songs on this album (a blend of 2 Tone ska, reggae, and various forms of Latin music) are joyous and full of life (in the face of ever-present mortality), but also display a keen awareness of the importance of speaking truth to power--see the title track: "Become the change you aspire/And I will see you dancing on the ruins"; the tightly-wound "Everything is Very Normal" ("Todo Esta Muy Normal"): "Walk to the corner, nothing happens here!/Check your pockets, you have plenty of money!/Go anywhere, everything works! "; or the longing for positive and profound change in "I'm Looking for Something in the Caribbean" ("Estoy Buscando Algo En El Caribe"): "I am not looking for similarities/Although I know we are all the same/What matters the political regime?/Democracy, dictatorship or socialism/We are still Latin American/Although they keep putting barriers/Because many things unite us/The crisis has no borders." Tokyo Ska Paradise Orchestra joins Desorden Publico on "Ska World Ska" ("Ska Mundo Ska") and Dr. Ring Ding toasts about the weather on "It is Cold in Berlin" ("Es Ist Kalt In Berlin"), and the band soars on tracks like the extraordinary "Cemetery of My Loves" ("Cementerio E Mis Amores"), sung from the point of view of a "Seventh Seal"-like figure of Death, and "Those Who Stay, Those Who Leave" ("Los Que Se Quedan, Los Que Se Van"), a mournful song about the exodus of Venezuelan youth from their troubled home country. 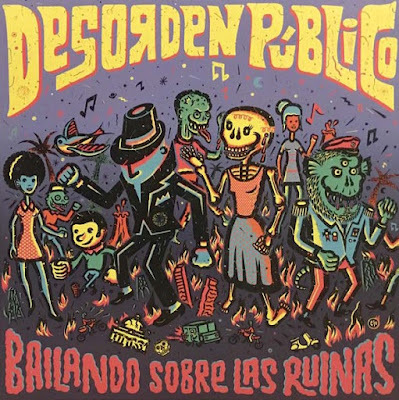 I'm sure I'm missing a lot of the context and commentary on Bailando Sobre Las Ruinas, political and otherwise, but what's not in doubt is that this a tremendously good album. Desorden Publico Bailando Sobre Las Ruinas (vinilo LP verde mar, rojo, amarillo, verde oliva, verde mar con obras de CHema Skandal, Jump Up Records, 2017): Este álbum de edición limitada (200 copias) fue lanzado en los Estados Unidos para coincidir con Desorden Publico recorrió Estados Unidos el otoño pasado, aunque el álbum realmente salió en Venezuela durante el verano de 2016. Si bien el español de mi escuela secundaria es crudo en el mejor de los casos, el título del álbum se traduce al inglés como Dancing on the Ruins, y muchos de las canciones absolutamente increíbles en este álbum (una mezcla de 2 Tone ska, reggae y varias formas de música latina) son alegres y llenas de vida (frente a la mortalidad omnipresente), pero también muestran una aguda conciencia de la importancia de decir la verdad al poder: ver la canción que da título al álbum: "Conviértete en el cambio que deseas/Y te veré bailar sobre las ruinas"; el muy cerrado "Todo es muy normal": "¡Camina hacia la esquina, no pasa nada aquí!/¡Mira tus bolsillos, tienes mucho dinero!/¡Ve a cualquier parte, todo funciona! "; o el anhelo de un cambio positivo y profundo en "Estoy buscando algo en el Caribe": "No estoy buscando similitudes/Aunque sé que todos somos iguales/Lo que importa ¿el régimen político?/Democracia, dictadura o socialismo/Seguimos siendo latinoamericanos/Aunque siguen poniendo barreras/Porque muchas cosas nos unen/La crisis no tiene fronteras." La Tokyo Ska Paradise Orchestra se une a Desorden Publico en "Ska Mundo Ska" y el Dr. Ring Ding brinda por el clima en "Es frío en Berlín" ("Es Ist Kalt In Berlin"), y la banda se eleva en pistas como el extraordinario "Cementerio de mis amores," cantada desde el punto de vista de una figura de "Muerte" y "Aquellos que se quedan, los que se van," una triste canción sobre el éxodo de jóvenes venezolanos de su país de origen en problemas. 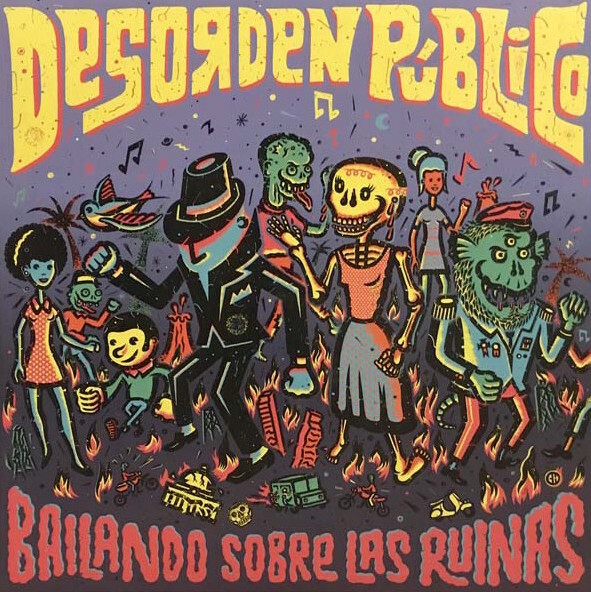 Estoy seguro de que me falta mucho del contexto y los comentarios sobre Bailando Sobre Las Ruinas, políticos y de otro tipo, pero lo que no cabe duda es que este es un álbum tremendamente bueno.